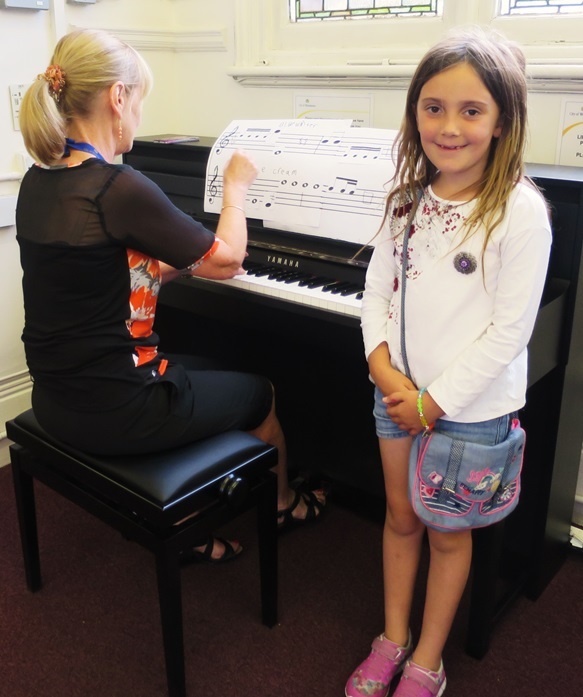 It’s the Summer Reading Challenge again, and Westminster Music Library always joins in! But what could we do to inspire our Summer Reading Challenge participants that would embrace this year’s theme – The Big Friendly Read? 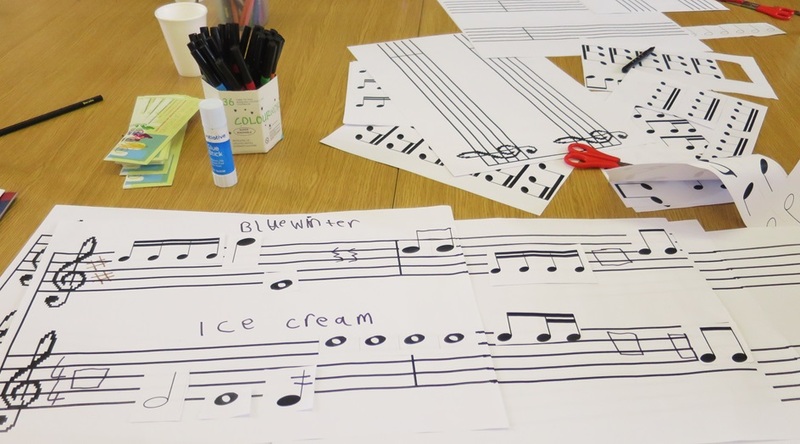 We love reading, we love music, and we like to celebrate all things musical in a big and friendly way, so how about some giant-sized compositional creativity? Suitably inspired by The Sailor’s Hornpipe and Rule Britannia, our budding composers set their creative juices to work. 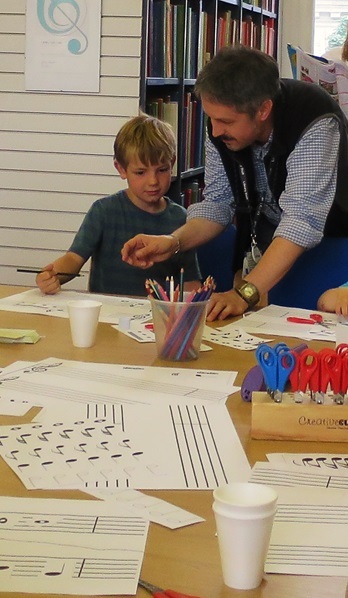 Lots of giant-sized notes to choose from, giant-sized staves to stick them on to, and a little help from our Big Friendly Music Library Team and the Big Friendly Children’s Librarian. We definitely had some musical prodigies in the making, before long some interesting and unusual melodies had started to appear; all manner of original harmonies which would doubtless impress some of our greatest composers. But no composer can be satisfied until they’ve heard their “magnum opus” performed, these Big Friendly tunes need to be played! 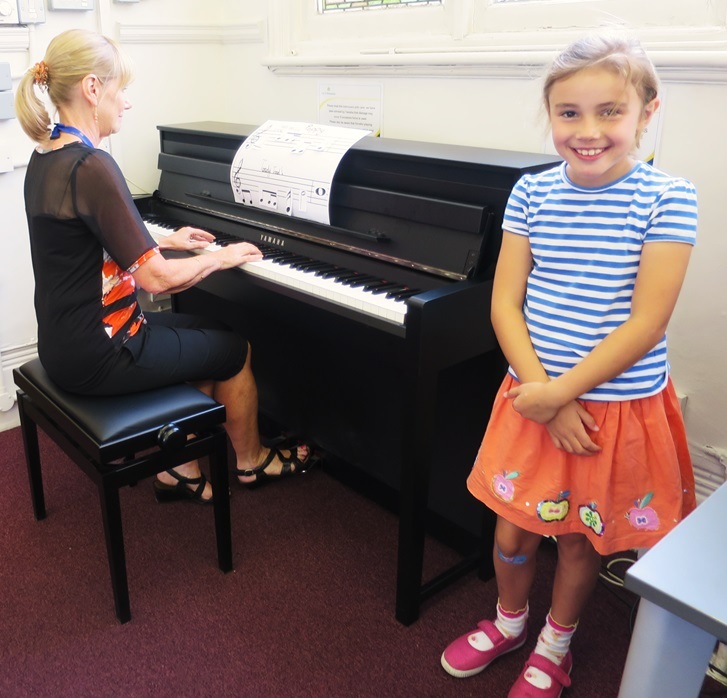 Luckily Westminster Music Library boasts a splendid piano, and even luckier, our Music Library Team has a pianist – who (fortunately) can sight read. Giant scores at the ready for our grand finale concert, this years’ Summer Reading Challenge as presented by the next generation of Big Friendly composers! 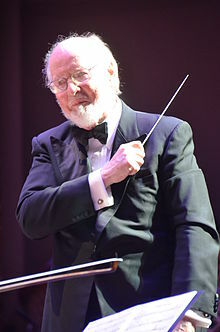 John Williams has written some of the most unforgettable film themes of our generation; his iconic music has lit up the silver screen in films like Star Wars, Jaws and E.T. In an industry shifting away from large orchestral scores, John Williams is the last one standing among traditional film composers. He doesn’t own a computer. In his small bungalow on the Universal Studio lot, John Williams composes using pencil and paper on a small writing desk next to his 90-year-old Steinway piano. He’s never owned a computer. Why not? He’s probably been too busy composing to ever learn to use one. He’s written over 120 film scores, a symphony, 12 concertos and numerous other symphonic and chamber works. He doesn’t let a day go by without writing something, and although his pace has slowed slightly, he shows no signs of ever stopping. Only one person has more Academy Award nominations. And that’s Walt Disney. John Williams has received a total of 47 Academy Award nominations, but he’s only won five. He started as a jazz pianist. He’s scored all but one of Steven Spielberg’s feature films. Their forty-year partnership started in 1972. Since then, they have had one of the most important film collaborations in history. Spielberg calls Williams a “chameleon of a composer” because of his ability to match the tone of any theme or subject matter. And the one he didn’t score? The Colour Purple, which was scored by Quincy Jones. 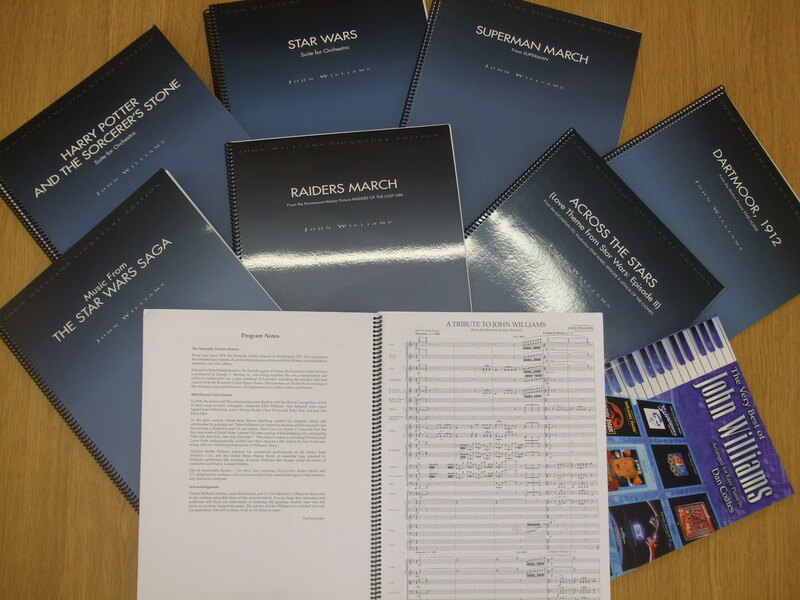 We have recently added a number of John Williams’ orchestral scores to the Westminster Music Library collection! Including: Music from Star Wars, March from Superman, the theme from Warhorse, March from Raiders of the Lost Ark, Harry Potter and the Sorceror’s Stone and if you’re feeling ambitious and fancy performing a John Williams medley with your orchestra, we have a set of parts featuring music from Star Wars, Jaws, Superman, Harry Potter, Indiana Jones and E.T. On 4 August 2014, the 100th anniversary of the day the First World War was declared; we opened a four day Behind the Lines creative summer school, due to end with a grand finale performance by participants alongside musicians from the RPO at St John’s Smith Square. Take a look at the Gallery too! The summer school featured two of our First World War composers who were also good friends, Maurice Ravel and Ralph Vaughan Williams. Ravel had wanted to be an air-bomber, but was rejected because he was too small; he was finally allowed to become an ambulance driver, and he saw and experienced the horrors of the front-line at first hand. Vaughan Williams was a stretcher-bearer, who also knew the unimaginable tragedies of the trenches. Both of them made their war-time experiences part of their music; Vaughan Williams in his ‘Pastoral Symphony’, and Ravel in his suite ‘Le tombeau de Couperin’. These works would be the focus of the summer school, using them as inspiration to create a new work for our final concert. Pupils from schools across Westminster and adults from local community group Open Age all contributed material for the final work, which was performed in front of an audience of VIPs, family and friends. From the opening chords to the incredibly moving finale – an off-stage performance of The Last Post – what started out as a lot of disconnected ideas, transformed into a very moving and fitting tribute not only to our chosen composers, but also our many First World War heroes. Some of the most moving poetry in English was written as a result of direct experience of the First World War. In Flanders Fields is one of the most memorable poems from the First World War written by a Canadian Officer John McCrae. “In Flanders fields the poppies blow between the crosses, row on row.” Poppies were everywhere on the battlefield of Ypres as they only flower in rooted up earth, and the whole of the Western Front consisted of churned up soil. Rosenberg (Isaac) wrote some of the best poems of the First World War. His poem ‘Break of Day in the Trenches’ had a special mention in Paul Fussell’s book The Great War and Modern Memory. He was born into a working class Jewish family in Dvink (now Latvia) – his parents then emigrated to the East End of London. 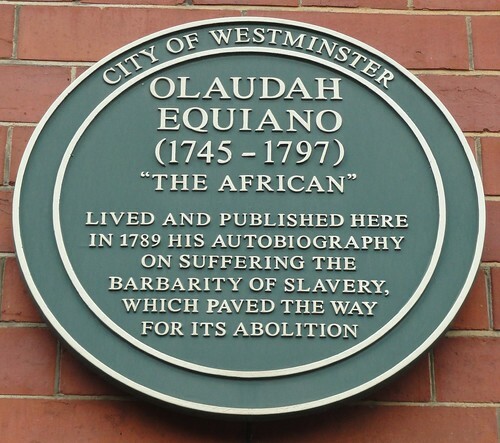 It was thought that he might have been one of the outstanding poets of his generation had he survived the war – his work was admired by T. S. Eliot and Ezra Pound. He was killed at the front in April 1918. Trained as a chorister in Gloucester Cathedral, Ivor Gurney was a composer as well as a poet. His lifelong friend was Herbert Howells, a director of Music in St Paul’s Girls School, Hammersmith. Gurney wrote a collection of poetry for his first book Severn and Somme, which was published in October 1917. He suffered from a mental health condition and spent the last fifteen years of his life in a mental hospital having been gassed in 1917, but it was in hospital that he returned to his wartime experiences and wrote some of his best works. Wilfred Owen is one of the most famous of the War Poets who tragically died in 1918 just one week before the end of World War I. He encapsulated the horrors of the battlefield in his writing. On 1 August, Cambridge University celebrated putting Siegfried Sassoon’s poems and diaries from the First World War online to mark the centenary of the war. They include an account of the ‘horrifying slaughter’ of the first day. Rupert Brooke was famous for his War Sonnets which included the poems ‘Peace’ and ‘The Soldier’. “If I should die, think only this of me: That there’s some corner of a foreign field That is for ever England”. Yates described Brooke as “the handsomest young man in England”. He tragically died from an infection caused by a mosquito bite on the way to Gallipoli. Love poet Robert Graves wrote his first known and loved poems behind the front line in World War I. He was wounded and pronounced dead by his surgeon during a battle but amazingly recovered to read an account of his death in the Times. He was one of the first War Poets to write realistically about life in the “soul-deadening” trenches. ‘Dulce et decorum est’ is a famous poem written by Wilfred Owen, who in October 1917 wrote to his mother “Here is a gas poem, done yesterday – the famous Latin tag (from Horace Odes) means Sweet! And decorous!”. The title was ironic. The intention was to shock people at home who thought war was noble and glorious. Websites – The War Poets Website contains lots of useful information about the First World War Poets and their poems. as does the First World War Poets Digital Archive . Poetry by Heart incorporates a First World War Poetry Showcase. Rudyard Kipling’s poem ‘My boy Jack’ was written when his dear son Jack went missing during the Battle of Loos in 1915. All the above books, and many more, can be found in our libraries. Click on the image links, or take a look at our First World War – War Poets and Poetry reading list, where you will also find several other WW1 book selections. Our last Behind the Lines* School workshop brought this part of our amazing project with the Royal Philharmonic Orchestra to a close, but what a brilliant finale it was. An enthusiastic bunch of pupils from Servite Primary School in Kensington joined us on a musical adventure through the solar system. With workshop leader Detta Danford and musicians from the Royal Philharmonic Orchestra, English composer Gustav Holst was our very own “stellar” musical guide. Following a short warm up, the RPO musicians introduced us to Holst’s Planet Suite which he composed between 1914 and 1916. Each of the seven movements is named after a planet of the Solar System and its corresponding astrological character, opening with Mars – The bringer of war. The RPO musicians played some very war-like excerpts from Mars, got everybody clapping along in time with the music, and asked us to describe what it reminded us of. There were lots of ideas that fitted with the “outer space” theme ranging from ‘menacing’ to ‘invading aliens’, very fitting for a planet associated with Martian invasions. But it was soon time for the musicians to re-launch the space ship to our final planetary destination: Neptune – The mystic, very dark and mysterious music, it almost sounded like the soundtrack to a horror movie. Not wanting to linger too long in this eerie and scary place, we stopped our space travel for a while, came back down to earth and explored the Music Library’s shelves. Time for our RPO musicians to be put to the test and show off their fantastic sight reading skills, being presented with scores by Mozart and Richard Strauss proved to be no problem at all. Even better than this, music from The Lion King and The Jungle book didn’t phase them, but the highlight was undoubtedly a rendition of Michael Jackson’s Man in the Mirror for vibraphone, glockenspiel and violin. These guys really know their stuff! There was still plenty of time to go back to our exploration of outer space and a return “trip” to Jupiter, this time for a musical re-imagining of this jolly planet. All the new ideas, rhythms and melodies the group created which had been inspired by Gustav Holst’s original Suite came together for a very “out of this world” final performance, before the return voyage to Planet Earth. The Planet Suite premiered in 1918 when The First World War was still raging. For most of his adult life, Gustav Holst taught music at St Paul’s School for Girls in Hammersmith, part of our very own Tri-borough. He paid tribute to the school and the area in his St Paul’s Suite for strings, and Hammersmith, prelude and scherzo for military band. *In 2013 Westminster Music Library teamed up with the Royal Philharmonic Orchestra for Behind the Lines, a large-scale programme of musical activities focusing on composers and music of the First World War. Our adult, family and schools Behind the Lines workshops may be over (for now – we’re busily planning lots of future musical activities – watch this space!) but there’s still our Summer School to look forward to next month where we’ll be commemorating the music and composers of World War One, and ending with a grand finale performance by participants alongside musicians at St John Smith’s Square.